Description The space ... the last fryer! 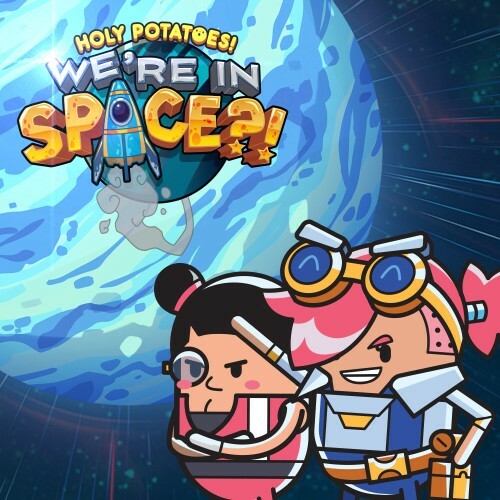 Go on an intergalactic voyage of discovery, adventure and puns made from potatoes in Holy Potatoes! We're In Space? !, With fierce battles, a fried management and a simulation gratin in a dish really from elsewhere! Lead Captain Cassie and his sister Fay to the galaxy looking for Jiji, their beloved grandfather, escaping the clutches of the evil Eclipse! Explore countless planets and galaxies, engage in turn-based battles and extraterrestrial events. Recruit a crew, use your resources to make a whole army of weapons and transform your ship into something truly spectacular! Venture into the immensity of a plant universe, but beware of the wrath of the Eclipse. In space, nobody will hear you brown!